,, Perto vista panorâmica de tirar o fôlego (80ft) para o Oceano Pacífico e praia vizinha. Você pode ouvir o rugido do oceano à noite. Sem telhados de olhar para (comparar e ver a nossa concorrência). Em uma 8º andar. Construído e comprada em 2009, piso plano eficiente. Materiais de qualidade e mobiliário, incluindo coleção de pintura multa de artistas locais. Perfeito orientação NE sol, quente no inverno e fresco no verão. Localizado no Recreo que é um montanhoso bairro residencial curta distância segura e pitoresco para a praia, lojas de pão, pizzarias, farmácias, pequenas mercearias, vários cafés, padarias, e outros peixes frescos pequena, vegetais e frutas fica, bem como alguns pequenos restaurantes. Excelente localização: Não lotado como distrito de Viña central pela Arauco Marina Mall, onde o tráfego poderia ser horrível. Você poderia dar uma caminhada de 15 minutos para a rua Valparaíso, onde você encontrará muitas lojas, cafés, parques e praças e parques como La Quinta Vergara. Use sua 'colectivos' ', que são compartilhados táxis, transporte muito barato. A propriedade está localizada entre duas estações de metrô você pode caminhar para, e visitar Valparaiso ou ir para o interior. Há 20 estações de metro de 'Estación Puerto' para Estación Limache ', cerca de 30 milhas passeio. Vem pronto para andar e usar o seu carro alugado para viajar fora da área. O estacionamento é caro e não muito disponível. A praia de Caleta Abarca natação também está muito perto, de 5 a 10 minutos a pé. Você pode tomar um passeio de bicicleta descendo a colina se conectar com uma moto trail lado do oceano pavimentado vindo de Valparaiso todo o caminho para Vina del Mar e Reñaca. Facilidade de luxo: O apartamento tem todos os móveis de alta qualidade cuidadosamente selecionados, incluindo sofás de couro fino e vários itens de madeira maciça nativas. Internet sem fios gratuita RÁPIDO. Últimas tecnologia Smart LED 3D TV: 47 "e 42" com a Netflix, YouTube, Red Bull TV, etc. Além de uma TV LCD 32 "HD 1080p e Sony BluRay DVD player no segundo quarto, um jogador de 26 TV de tela" LG plana e DVD no quarto 3.
linha de telefone de rede fixa, com local e longa distância nacional ilimitado gratuito incluído. Sala grande comunidade conectado a um pátio e piscina de Verão, além de sauna e ginásio. 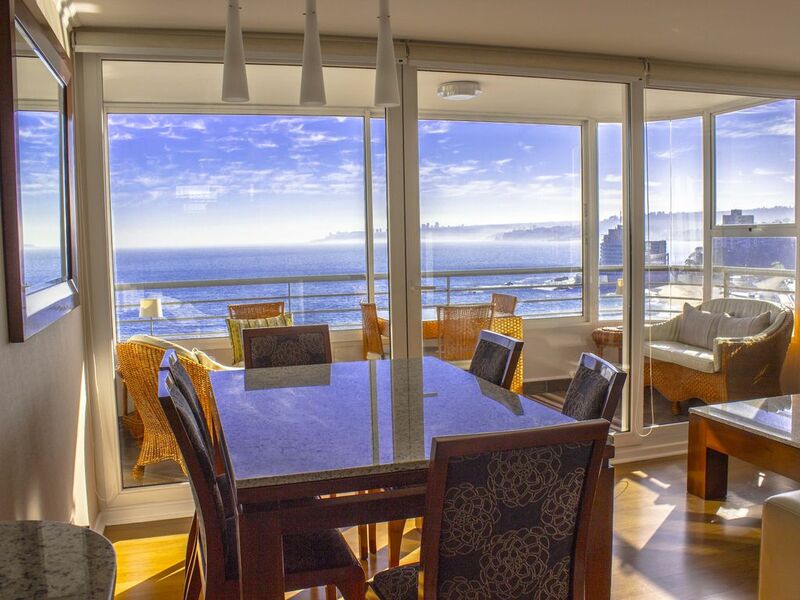 A melhor vista de toda a HomeAway em Viña del Mar: Oceanfront: Vista para o Caleta Abarca natação vista para a praia e oceano ilimitado. Não há outros edifícios bloqueando a visão do oceano que nunca. Sua gosta de estar em um navio de cruzeiro. Esta propriedade fica perto de tudo e bem ligado às auto-estradas de alta velocidade, metrô e transporte público de todos os tipos. Se você gosta de completo isolamento e ruído do tráfego estadia gratuita, este não é o lugar que você está procurando. Muito ergonómico, repleto de armários espaço e grandes espelhos de parede, armário de remédios. Luxo torneiras europeus banheiro, pia e chuveiro combinação. Sistema de filtro de água de osmose reversa para água potável. Regular LG lavadora e secadora Whirlpool no local. Máquina de lavar industrial capacidade adicional e secar roupa em área comum. Elevador. Pelo menos 2 conjuntos de roupa completa para todas as camas. 12 conjuntos completos de toalhas de banho e toalhas de cozinha muitas. Utensílios de cozinha oferecidos: Completo prato-ware para 24. Qualidade de aço inoxidável e esmalte panelas de ferro fundido e panelas. Conjunto muito completo de pequenos utensílios e aparelhos para começar o trabalho feito !! Geladeira: LG marca com freezer grande para estadias mais longas. Máquina de lavar loiça: 100% de aço inoxidável com 1/2 ciclo de carga. Garagem: Estacionamento subterrâneo # 78 de nível 3. Entrada de controle remoto fornecido. Cabo básico com alguns canais de Inglês. 47 'Smart TV LED 3D e 3D BluRay jogador no quarto principal 42 "TV na sala de LED, 32' 'LG TV HD e Blu-Ray no segundo quarto e 26' LG HDTV e leitor de DVD no quarto 3. Angela is a wonderful host - welcoming and extremely organized. She has literally thought of everything you might need for a comfortable stay and ensured it is available. The apartment is exactly as advertised - clean, well stocked, comfortable and stylishly furnished. The location is fantastic, an easy walk to bakeries, cafes and the like. Buses, colectivos, trams and taxis to Vina del Mar and Valparaiso are also within an easy walk. Finally, the view from the enclosed balcony is amazing!!! We throughly enjoyed our stay at this beautiful condo. The views were breath taking and it was centrally located with many spots near enough to walk to. It was a joy to come home to every day. I highly recommend it. We had a lovely stay in Vina del Mar at Francisco and Jan's apartment. Everything was as expected, and the views and light are outrageous. The apartment is well equipped, spacious and perfectly situated by the ocean and for excursions into Valparaiso, by light rail, bus or taxi. We had the opportunity to meet Francisco and Jan in person, and they gave us good neighborhood information and were very responsive. We enjoyed exploring Vina and Valpo, but it was hard to peel ourselves away from the endless views. Thank you to Francisco and Jan for a great experience. There were four adults in our party and this apartment was perfect. We realize how lucky we were to stay at this apartment. It was warm and inviting from the first step in the door. First you are greeted by Angela, the housekeeper, who shows you around the apartment. Fresh flowers and fruit greeted us on the table. The view is spectacular. The accommodations wonderful. The apartment is clean and very well maintained. It has all the amenities of home and then some. There is a washer and dryer which came in very handy. The beds are very comfortable and we slept very well. The sunsets over the ocean are spectacular. The building is secured and the staff at the desk were always pleasant and friendly. We took the Metro which is located close to the apartment and took Ubers easily around town. You will not be disappointed if you reserve this apartment. We had five adults stay in this place in mid October (2016) and it was perfect! The unit was exactly the way it was described, and the views from the apartment were breathtaking (even better than the pictures). The host onsite (Angela) met us on arrival and was very cordial, pleasant, and helpful. She even brought flowers to welcome us to Chile. We used public transit for most of our stay, and this place is located just a few blocks from the Metro trains and the bus system. We also arranged to use the car one day, which was terrific. The building itself is clean, well-kept, and secure. We appreciated the kitchen, the washer/dryer, and the very comfortable beds that were in this apartment. We talked to Francisco (the owner) a couple times while planning our trip and arranging for the use of the car, and he was gracious and accommodating from beginning to end. The hospitality we experienced on this trip was wonderful. We highly recommend this apartment! We stayed at this beautiful apartment in the middle of July, and it was fabulous. For most of the visit, there were 5 of us (two couples and one teenager), and for several days it was just the three of us. Francisco’s place was perfect for both of these combinations. As someone who has stayed at many places that don’t look at all like the pictures, I can assure you that this place looks even better than the photos, which is hard to imagine, but true! Francisco has thought of every single detail to make this place fantastic. The internet was wonderful (15MB down, 2MB up) and allowed me to use my VOIP to make crisp phone calls to the US with no annoying delays or echos. The sheets, pillows, and beds were absolutely amazing – he must have brought those in from somewhere else, because I have never slept on sheets like that in Chile. The master bedroom was particularly heavenly, with a wonderful view from the bed AND reflected in the mirror. The kitchen was stocked with everything you could imagine, and we used the kitchen early and often to make breakfast, lunch, and dinner. And the living area is absolutely incredible. Although I had to work the entire time I was there, the views from the dining room, living room, and the enclosed terrace were breathtaking and made working almost enjoyable! The heating kept us toasty warm on the cold days and at night, and we were able to open the windows and let the breeze come through on warmer days. Angela, the caretaker, gave us a detailed orientation to the apartment when we arrived and was attentive to our questions while we were there. Although the apartment is not located in Vina del Mar proper, this is actually a benefit, as it keeps you away from all of the congestion and hustle and bustle and allows you to truly relax. We walked and took collectivos into downtown Vina del Mar, and both were very acceptable options, depending on whether we wanted a bit of exercise or were going to be loaded down with groceries. We had amazing seafood, some of which we bought from the vendor down the street. Francisco is a great host, attentive to all the details from start to finish -- including fresh fruit and flowers on arrival and speedy return of deposit after departure. You truly get what you pay for here. Although the rates are higher, they are definitely worth it for the experience. We will be back, that much I know! Thank you again Francisco for a wonderful time! Viña del Mar, comumente chamado apenas Viña, foi desenvolvido na década de 1870 como uma área residencial e de verão exclusivo para o bem-to-do do Chile. Ainda é isso, mas evoluiu em estância balnear estreia do Chile, muitas vezes chamado de Riviera Chile. Viña del Mar oferece todas as comodidades de uma cidade resort: propriedades de luxo, incluindo a casa de verão do presidente do Chile, hotéis à beira-mar, parques e jardins, clubes sociais, um casino municipal e teatro, instalações desportivas, praias, golfe ténis, cavalo racing, animada vida nocturna, restaurantes, e fácil acesso às praias próximas e cidades do recurso de Zapallar, Concon, Cachagua, ea cidade em rápido crescimento e muito popular de Reñaca. Don't proceed with any payment or online reservation until you agree and sign our rental agreement and policy that will be emailed to you. Once we receive your signed rental agreement we will accept payment and book the property for you.